Continued in the Life of Meriton Latroon, and other Extravagants. The Book-sellers Prentice gives an account of his Masters first tricks in Cheating, by Printing Books that were other mens Copies. After this conference with the Scrivener, I went home; and as he told me, my saying to my Master that I had been with him was sufficient, so I found it; for I was asked no more Questions, but went to bed ; and there did I recollect to my self, all that he had that evening told me : and though I could not perfectly remember the several terms of Art he used, as Judgement, Execution, Scire facias, Statute, Procuration, and Continuation, &c. Yet I was sensible of their meaning, and did very much wonder, how any man could sleep being guilty of so many crimes as he and his Master were; yet I found that they slept the better, or at leastwise fared the better, by reason of their great wealth; and then did I compare my forepassed life, to what I had heard of them, and it was not worth mentioning; so that from that time, I had a more charitable opinion for my self then formerly. And since I had so good success with my Scrivener, I was resolved to be a little more intimate with the rest of the Society, especially the Book-seller, that I might know how he gained his Money: and the next day I had my desire; for meeting him abroad, we went to an Ale-house, and there did I discover to him part of my yesterdays actions with the Scrivener, and thereby induced him to make me this following Discourse. Truly Brother (for so we called one another) you have told me wonders, though so admirable, that I could not have thought so much crafty knavery could have been committed by any man breathing, though I did believe that there was more then I understood, having always heard that it was a dangerous thing to squeeze Wax, and that Scriveners in general were cunning fellows, but that any man out of nothing should by tricks and subtile contrivances, gain to himself so great an Estate, and yet not run into the compass of the Law, but now I see the Proverbs verified, Nothing venture, nothing have, and that a blot is no blot till it be hit, and give a man luck and throw him into the Sea. And although I have thought my Master a man cunning and crafty enough, and did believe that he who deals in Books could not be outwitted, yet I see that a piece of Parchment with a seal to it, is better then a great many Books, nay then a whole Impression: but that I may give you some satisfaction in what you desire, I shall proceed in my Discourse; and though I cannot tell you so many, nor so profitable contrivances as you have related to me, yet those of our calling deserve not to go much behind, and we do our utmost good will to cheat, though it turns not to so good an account. My Master when I came to Prentice had but a small stock of Books, and those were all in his Shop, with which, together with some paper, parchment, pens, and such like Stationers ware, he made a shift to pick up an indifferent livelihood; but he being of a reaching brain, and seeing there were very rich people, such as gained great Estates, and lived bravely of the same trade: he made it his business to inquire into their way: the most sorts of Books that we sold were Testaments, Psalters, Grammars, Accidences, and such books as we call Priviledged ware, and indeed were Printed for the Company in general, and to be had of some of the Stock-keepers, or masters of the Company, or at the Hall, and though our profit in selling these sorts of books was but small, as not above two pence in the shilling, yet it was a certain commodity, and the sale sure: whereas other books; either of Divinity, History, &c. were not so certain, though more profitable, as commonly bringing four pence in the shilling profit, and thus did we continue buying books of other book-sellers, as we were asked for them, and had occasion; my Master commonly keeping to one man, because he could there be trusted and furnished, with any book he wanted, it fortuned that a new book being printed, a small thing of about four or five sheets of paper: it sold so well, that my Master went often for them to his wonted place: one time they had none of them left, but desiring my Master to stay, they would send for some; which my Master did, but the Messenger came back without any, and brought word that he should not have any more of them upon account or exchange, for he now held them at ready Money, and that he would have, or part from none; well then, said my Master, I will go thither and buy some my self. No, said the Master of the shop, you shall not need, I'le send for some this once with ready Money, and you shall have them cheaper of me then of him; and so he did, and he received them and told me, that if he wanted any more, he could be very well furnished with them within three or four days, and the other had been better not to have served him so; but the book selling very well, all my masters were gone that night; and I went my self to the bookseller who printed them for some, the which I had; but the next day I went again, he had none, and told me that I could not have any in a weeks time. I acquainted my Master herewith, who being called upon for some of them, went to his old place to see if they had any, they told him they had none at present, but to morrow he might have what number he pleased, accordingly the next day I went, and brought fifty of them with me; and then my Master (beginning to suspect that which he afterwards found out) sent me to the booksellers who printed them, and he had none, wherefore he then concluded that the bookseller with whom he was wont to deal had printed them, though they were none of his Copy, at which he wondred: for the greater sort of booksellers did use to inform us that it was a most heinous and unlawful thing to print another mans Copy, so that I think, this was the first time that my master discovered this Mysstery, for the Book continuing to sell, we sold in our Shop above five hundred of them; so that my Master begining to consider with himself, reckoned that he had payd to his Dealer above five pounds for these Pamphlets, and yet got very well by them too: wherefore not long after coming into the company of a Printer, he asked what it would cost to print 2000 of a Book of five Sheets of paper: the Printer replyed, Ten pound: by this my master guessed that his Dealer had gained half in half by him: for he had paid for 500, half what 2000 would cost. My Master holding some further Discourse with this Printer over a pot of Ale, he told him that he did work for such a man, naming the Bookseller with whom my Master dealt, and saith he, I lately did two sheets for him of a book he gained well by, for I printed 5000 for my share: so that at length, after conference together, they concluded it was the same book my Master fold so many of, and that he had printed it in three or four places for expedition, and that he could not gain less then 30l. by printing it: I but says my Master, how will he do to answer it to the other man whose Copy it was ? For that, said the Printer, he will do well enough, for the other is but a young man, and light upon his Copy by chance; and though the Law forbids such doings, as the printing one anothers Copies, yet the great ones commonly devour and eat up the little ones, and will venture on it being but a small thing; and it may be this young man is indebted to the other: and indeed it is a usual thing, and we do such Jobbs very frequently, especially for the Grand ones of the Company. But how comes it, said my Master, that some or other do not print their Copies, as Testaments, Psalters, &c. As for that, said the Printer, it is very dangerous, for if they were taken, it belonging to the whole Company, they would be sure to seize on it, and sue the party so offending; besides, the books are too big for every one to venture on, & will lie too long in hand a doing; but sometimes such things are done, but in another way, as I can tell. Thus ended my Master and the Printer their Discourse of this matter, and my Master desired the printer to call on him some times, and he would drink with him; and it may be have some employment for him, and thus they parted. My Master now understanding thus much of his Trade, more than formerly, was resolved it should not be long ere he were doing somewhat: thus pondering in his mind, he could not tell what design to begin with, for we sold very little but priveledged Ware, and those it was dangerous medling with, neither would my Masters stock reach to any thing considerable; at last resolving to play at small game rather then stand out, he bethought himself, and resolved to print the A B C, a little Childs book of a sheet of paper: he knew not then what printer to intrust, for he durst not make use of the former Printer, lest he should acquaint his Dealer; but it was not long ere he light upon one fit for his purpose, and to work he went, my master sending in paper, and so they were printed, delivered, and paid for, but when my Master had them, he knew not how to dispose of them, lest he should be caught; but that he might have the better pretence, he went and bought 300 of them of his Dealer, and so laying them by, sold his own, and being acquainted with a primer-binder, he got him to exchange with him for primers, and such like small books he was rid of most of them to his great profit, for he gained, as I have heard him say, above five pounds by that jobb, which was then a great deal of money, and by this means his Shop was better furnished with small books & paper, and now he had good credit with the paper-Merchant, which before he could not have. Not long after, the Printer who had printed the A B C came to him and acquainted him, that if he would venture a matter of ten pounds, he might be concerned in printing of a book that would turn to a very good account and it may be get twenty pound by the bargain: he having had such good success in the last, ventures upon this, it was a Sermon that then sold very well, and he had another partner, and my Master having some money by him, and pretty good credit at the paper-merchants; he found paper, and the other paid for printing, and at two places it was done in a Week; my master putting them out in London to the Mercuries and others at one penny a piece less then the ordinary rate, and his partner dealing with Country-Chapmen, sent good store away into the Country; and thus, though this was another mans Coppy, they sold all their books in a short time, and gained 25l. a piece. This was a good beginning, said I to the Bookseller, and Idid not think your Trade had been so profitable; but now I believe, that these courses being prosecuted, a considerable Estate may be gained in a short time: that you shall soon hear, replied he: but the Discourse being somewhat long, I shall for the present end, and prosecute the rest in the following Chapter. He proceeds in the discovery of his Masters ways in cheating, in preferring some Copies, and other ways of getting Copies. My Master having now had some experience in this way of printing, was resolved to play above board, and get some Copy or Copies to print, that he might own; which in short time he did, and glad was he to see his name in print, supposing himself now to be some body: but these things did him but little good, and sold but easily, he not having the way of preferring books, and sending them to some Country Chapmen, and the rest of the booksellers, who endeavor to crush any beginner, and will not sell his books, unless they may have them at their own rate, would not sell any of them, for him? and besides, now he gave Mony for his Copies, the other costing him nothing: and though a book be never so good, they will not sell with some men, for the others will undervalue and spoil it: as for example, If my Master had printed at that time the best book of Chirurgery, Husbandry, Cookery, or the like in the World, and though the book had been famous enough, so that every one desired it, and asked at any booksellers shop for it, they would have said to their Customers, Truly Sir, there is such a book, but in regard it is a foolish idle thing, and of no weight, I have not any of them, I will not trouble my shop with them; but Sir, here is another of the same Subject, that is much better, and in great esteem with ingenious and knowing men: If the Customer replies he would have only that book and no other, for that it was recommended to him for an ingenious well-writ piece, then will he reply, Truly Sir, I never heard any of your judgement before, till now I was never asked for them; but since you speak so well of it, I will procure you one: and then it may be, for all this Discourse he will shew you one, as if left by chance, or else send to his neighbour-bookseller for one. Thus will he disparage other mens books, and prize his own, and many times put off some of his own, the buyer being so civil as to believe him: and this is a general Maxime, That they will not offer, or prefer a book of any mans printing except their own, unless they have it either in exchange or at a low rate; and this is the cause that there are some books as considerable, and good as any in England, that did not sell at first for little better than wast paper, till some of the Grand ones of the Company get them all into their hands, and then they sell for three times the price they did. But to leave this Discourse and proceed, my Master having now printed two or three things, did look upon himself as somebody; and though he had not such good success in his last undertakings as before, yet he made a shift to get what they cost him for paper and print, and had many of them still by him to sell when he would, or exchange; but he having but two or three sorts of books, could not do much good upon that: he seeing this, and observing what books sold best, it being at the beginning of these late Wars, found that factious Sermons, and such like things would do the business; he thereupon bestirs himself, and gets acquainted with most of the factious Priests about Town, by often hearing them and frequenting their Companies, and having learned to write short-hand, took notes of their Sermons, which he collected together, and now and then he would get them to revise one of them, and print it; by this means spending much time and mony amongst them, he grew very intimate, and was become the general publisher of most of their Sermons and Controversies. This was that which brought him great gain, in a short time he could vie with the best, what he sold not for mony, he exchanged for books: and now he could command any book in all the Company without mony, upon account, as is the Custome. His Shop being well furnished, he gets a Ware-house, where he bestowed his books in quires; and being thus furnished, he was first spoken to by some Country booksellers, and then writ to by them and other, for severall books, so that any thing that he printed he could fell off well enough; for having good hap to print some very good selling books, they helped away the other that were not so good, and still were thrust into the parcel among the rest: and now having some good Authors, he would not accept of every one; and as he formerly had sought for, and courted Authors to write books for him, now they (knowing his way of preferring and selling of books) followed, and courted him to print their books. If a stranger came with a Copy to him, though never so good, he would tell them he had books enough already; but however, if they would give him so much money, he would do it, and they should have two, or three, or six books for themselves and friends: many a one did he thus perswade out of their mony, being desirous to be in print. If he had a desire to have any thing writ in History, Poetry, or any other Science or Faculty, he had his several Authors, who for a glass of Wine, and now and then a meals Meat and half a Crown, were his humble servants; having no other hire but that, and six or twelve of their books, which they presented to friends or persons of Quality; nay, and when they have had success, if they wanted any more books, they must pay for them: further I have known some of our Trade, that when a poor Author hath written a book, and being acquainted with some Person or persons of Quality whereto he Dedicates and presents it, the Book-seller will go snips and have half shares of what is so given him. My Master being now gotten to the height of his Trade, was soon called on to be one of the Livery of his Company, which though it be somewhat chargeable at first, yet it soon brings in profit, there being many conveniences therein; for they have liberty to put in a sum of money into the publike Stock, and so great is their profit, that they have seldome less then twenty per cent, and then when, they come to be Stock-keepers or Warden they have the disposing of the Stock-books, such as are Testaments, Psalters, &c. and putting them out to print, they often print so many overnumbers, that shall serve them as long as they live. In particular, there is no Trade that I ever heard of, that gets so much by their Commodity for whatever they print, if it sels, they get eight pence in the shilling: and for those that deal with Country-Chapmen, they put off the bad well enough at one time or another; and if they are very bad, then a new title is printed as if it were a new book; and what with this and changing, they march off in time. There was one preacher in London that my Master was much respective to, for he had gained much money by printing several of his books (and though my Master in outward appearance seems a Saint, yet he hath his freaks, and will be merry with his friends, and be prophane enough.) One Sunday my master having been rambling in the fields, entred the City in the afternoon just as sermon was done, and seeing this parson going before him, he stept forwards, and overtaking him, salutes him thus, Sir, I am glad to see you so well, indeed Sir, you have this day taken a great deal of pains, and we are all beholden to you for your Soul-saving Sermon: how say you, said the Parson, what do you mean? Why Sir, I thank you for your Sermon you preached this afternoon: Nay, now Sir, said the Parson, I see you are mistaken, for I have not preached this day, my master hearing this, was wonderfully surprized, not knowing what to say, but left the Parson and came home discontented at his error. We having several Country-Chapmen, some whereof owed my master considerable sums of mony, he took occasion to go into the Countrey, and to be sure, he would make it worth his Journeys for at every considerable Town he would buy some books, and sell them at the next, or send them up to London, and sometimes whole Libraries; and he did take order with all his Chapmen to acquaint him with all Libraries or parcels of books that were to be sold, which if worth the buying he would have. He would also frequent the Schools, and by drinking with the School-masters, and discoursing of books and learned men, he would get their custome to serve them with School-books. There was one famous Country-Parson whom he much desired to be acquainted with, and to him he rid, telling him he was troubled in mind, and desired him to satisfie him in a case of Conscience, the which he did; and then for his satisfaction, and to oblige him, he prayed and courted him to see him when he came to London, the which he did, and all this was to get the printing of his books. If a Customer comes into our Shop to buy a book, he hath such ways of preferring and recommending of it, that they seldom go and not buy, for he will open the book, and if it be Divinity, shew them one place or another, out of which he will preach to them, and tell them, that very saying or discourse is worth all the money in the world and if they do not like it when they have read it over, he will take it again: and so many of our Trade will promise, but you shall hardly ever get your money again, you may chance to have them exchange it for some other book, which they will be willing to do if there be money stirring in the case. My Master having had a book written for him by a Poet, the Author (not having the wit to make his bargain, and know what he should have beforehand) when he had finished it, desired payment for his pains: Nay, said my master, you ought rather to pay me for printing it, and making you famous in print. Well then, said the Author, if you will not give me money, I hope you will give me some books. How, said my master, give you books, what will you have me forswear my Trade, and be a book-giver? I am a book-seller, and to you I will sell them assoon as to another, if you will give me money, paper and print costs money, and this was all the Author could have for his pains. My Master is now one of the Grandees of the Company, and that besides the ordinary way gets him something. Not long since, he and others went a searching, and finding an impression of unlicensed books, seized them, but instead of suppressing and turning them to wast paper, they divided the greatest part of them amongst themselves, and immediately my Master sent some of them away to all his Chapmen, and the rest we sell in the Shop. It so fell out lately; that a book being to be Printed, my Master repaired to the Author to get the Copy, but another of the same Trade had been there before, to whom it was in part promised; but however (out of respect to my Master) the other being sent for, it was agreed that they should have the printing of it between them; whereupon one printer was imployed by them both to do the work. My Master soon after sent for the Printer, and tells him, You must do me a kindness: Yes Sir, said the printer. It is this, said my Master, I am to give away to the Authour some Books, wherefore I would have you to print 200 for me above the number, and do not tell my Partner, and I will pay you: Yes, said the Printer, and so he did, and was paid for them accordingly. But the Printer seeing the knavery of his imployers (for the other had been with him; and engaged him to print the same number of 200 over, pretending some private use he had for them) he likewise printed 400 over for his own use, and publiquely sold them; and neither of them could or would complain of him to the other, because they knew themselves guilty of the same crime. One of the greatest pieces of profit the whole Company hath, is the printing of Almanacks, for by that, I believe, they clear above 1000 l. per annum: but a knavish Printer lately outwitted them, for he printed a great number of Almanacks, and though he printed but two sorts, yet they served for all the other sorts, only altering the Title page, at the beginning, and the last sheet which we call the Prog, or Prognostication; and these Almanacks he affording cheaper then ordinary, as indeed well he might, he sold off a good number of them, which was to his gain and their great hinderance; but he is lately discovered, and how they will deal with him I know not. In the late times of Liberty, when every one printed what they pleased, if one Bookseller printed a book that sold, another would get it printed in a lesser Character, and so the book being less in bulk, though the same in matter, would sell it for a great deal less price, and so undersell one another: and of late there hath been hardly a good book but it is epitomized, and for the most part spoiled, only for a little gain: so that few books that are good, are now printed, only Collections and patches out of several books; and Booksellers employing the meaner sort of Authors in spoiling anothers Copies by such Epitomies. A young man being lately to set up, was a suiter to my Master to speak to the Company to lend him 50 l. for a certain time without interest, as is customary: for there are several sums of money left the Company so to be disposed of, for the benefit of young beginners. My Master knowing his power in general, particularly promised to effect his desires, provided that the young man would agree to lay out his money when received with him; telling him, he would use him well therein: but whether he did or no, you may guess, for he kept not open shop above six moneths before he broke, and is now gone for a Souldier, and the Company in general likely to loose the money. This, replied I, is one of the worst acts I have yet heard of, if it were intentionally done, for it is an abuse of the Donors will; but I see it is not material with some men, if they get money, how they come by it: but I pray, let me hear the rest of your story. That you shall, said the Bookseller, but first let us drink; which he having done, and I pledged, he proceeded, as you may hear in this following Chapter. The Book-sellers Prentice having discovered his Masters way of Cheating, now discovers his own. Thus, said the Bookseller, have I given you a summary account of the most part of my Masters dealing, and the main way how he gained his Estate; for at this time he hath a shop very well furnished with all sorts of bound Books, and two or three Warehouses full of Books in quires; he hath above 1000 l. owing him by Country-Chapmen; some Estate he hath in Land and Houses, and a very good Stock in the Hall, and all this is acquired in six years time out of nothing; and in this account of my Masters dealing, I have acquainted you with the greatest mysteries of our Trade: but, said I to him, I must confess you have told me those things I was not only ignorant of, but what I could not have believed could have been done, and so great an Estate could have been gained by the bookselling Trade, especially from so small a beginning as an A B C: but all this while the mystery is not disclosed; for though you have told me how your Master gets money, yet I hear nothing of your gains, neither indeed can I as yet conjecture how you should be furnished with money ; for I suppose you keep an account of what you receive and pay, and that your Master takes care to look into his accounts, that no great matter can be gained that way. 'Tis very true, replied the Bookseller, he does so; and as he is of a false knavish temper himself, so he is suspitious of me, and very vigilant and watchful over me: but do you think, that I who have observed all his ways and crafty dealing, cannot find a way to be even with him, and put money into my own pocket ? and indeed he does allow of my knavery and craftiness in over-reaching of others; for he in general is accounted the fittest servant of our Trade, that can out-wit and over-reach his brother-Bookseller; for it is not so much our keeping Shop, and selling a few Books to Scholars, Parsons, Gentlemen, nor sending to Country-Chapmen, for in that we use a constant price, and there is not much wit or craft to be used therein; but the craftiest part of our profession consisteth in making an Exchange-note with other Booksellers to the best advantage; and there is our greatest prize: for if any of our Chapmen send to us for Books, such as we do not print, and such as we are not at present furnished withal, then away we go to that Bookseller who is best furnished with them, and desire to make a Note with him, which he (being desirous to fort himself with some of our Books) willingly consents to; then do we commonly pretend least use for those Books we most want, otherwise we should be sure to go without them, unless we took many of other sorts, that were little better then wast paper; and so we, by telling our brother Bookseller that of such a Book they are almost gone, and the like, we put off the greatest number of our worst Books, and the fewest of our best; and being indifferent of taking any quantity of those we most need, we commonly have most put upon us; and so are furnished with what we desire: and in this way of exchanging Books for Books, we have the most occasion of exercising our wits, and many times receive commendations from our Masters for so doing; and when we meet with one another, the business being over, triumph over those we have thus outwitted. This business of Exchanging brings us Prentices acquainted with each other more then any thing else, for that this matter is commonly left to our management; and on this acquaintance depends the greatest part of our profit: for though we can sometimes when we take money in the Shop put up half a Crown or a Crown for a Book that our Master knows not of, yet that is but seldome, and little Money is given us, unless it be by the better sort of Customers, whose Books we carry home, and then perhaps we may have a shilling or two bestowed on us; but this is nothing in respect of our other profit, which I shall now tell you of. We trading for a great deal to Chapmen into the Country, do print very much, and sometimes one Book is printed very often, and a number of 25 or 50 cannot be so discovered: sometimes we are in fee with the Printer, procure him to print such a number over for us, which he consents to, that he may do as many for himself: and then for the manner of our selling of them, it is by Combination, Confederacy, and Correspondency, which some of us Apprentices have with each other; for we have our Warehouse as well as our Master, and are furnished with much variety; every one of the Combination bringing some quantity to this joynt-Stock, of what his Master printeth; and then as occasion serveth we furnish each other: but the chiefest way of making money of these, is by three or four young Booksellers, who being newly set up do buy them of us, it may be two pence in the shilling cheaper then they can buy them of our Masters: we have ready money, or at furthest when they have sold them; and to this end we have commonly one of these Booksellers in every considerable place of Trading about Town, and sometimes we employ a rambling Bookseller to go a Birding, and offer them at places, and oftentimes our Masters buy some of their own Books of this Ubiquitarian-Bookseller; and one or two being intrusted with management of the Stock, gives account to all the rest; and so we divide the profit; at other times we being employed by our Masters to get in Books for our Country-Chapmen, we inform them that the Book being out of print we cannot have it without ready money, and then we being ordered to get them, (for our Customers must be served) we have them out of our own Stock, and put the ready money into our pockets. Sometimes I have gotten fourty or fifty shillings by being partners with one of the young Booksellers in printing a Pamphlet; and if it be an unlicensed thing, we sell them privately to Customers in the Shop; if a factious thing, we have our factious Customers; if obscene or wanton, we accordingly are provided with those that buy them: and thus with these ways, and some others which are too long to relate at this time, I can make a shift to spend fourty or fifty pound a year, to keep my suit of private cloaths, and to allow my Wench eight shillings a week, to whom I constantly pay that Portion; and I think my share of the Stock at present may amount to fourty pound. And thus you see, that though so many thousands go through the Scriveners hands, and so few through mine, yet I can make a shift to get some money out of our paper, as well as he out of his parchment; and I doubt not, but when I come out of my time, to do as well as the best of our trade; for having learnt so much in this Art, I question not but I shall put it in practice to my advantage. Thus did he put an end to his Discourse; and drinking a Pot or two more of Beer, having had some other merry discourse about the Scriveners Wench, and such like other matters, we parted; he, to go meet with some of his brother Booksellers, to take account of their private Stock; and I, to my Masters about my ordinary Imployments, still ruminating in my mind of all the passages that these two Blades the Scrivener and Bookseller had related to me; and from thence did conclude, that I should find all the rest of our Clubbing-brethren stored with the same Discourses; and now I meditated on nothing more then how I might get money enough, for that was the only thing that made crooked things straight; and if a man have enough of that, he may defie all men. It can make knees bow, and tongues speak against the native genius of the groaning heart; it supples more then oyl or fomentations, and can stiffen beyond the Summers Sun, or the Winters white-bearded cold. In this we differ from the ancient Heathen; they made Jupiter their chief God, and we have crowned Pluto. He is Master of the Muses, and can buy their Voyce; the Graces wait on him, Mercury is his Messenger, Mars comes to him for pay, Venus is his prostitute; he can make Vesta break her vow, he can have Bacchus be merry with him, and Ceres feast him when he lists; he is the sick mans Æsculapius, and the Pallas of an empty brain; nor can Cupid cause Love, but by his Golden-headed Arrow. Money is a general man, and without doubt excellently parted: Petronius describes his Qualities. Et peragat Causas, fitque Catone prior. Et veniet: clausum possidet Arca Jovem. And do all things better then Cato might. Whole Servius, and what Labeo could possess. 'Twill come, they in a lock'd Chest keep a Jove. And to conclude, as it commands Gods and Goddesses, so all sorts of men and women are obedient to him that has the command of this God Money; and therefore I was resolved to put in for a share of it. Note on this text: Francis Kirkman (1632–approx. 1680), an English bookseller, wrote two books about his adventures as a rogue, a book pirate etc. 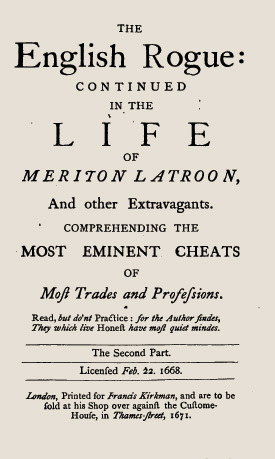 The Unlucky Citizen Experimentally Described, printed in 1673, and The English Rogue Continued, in the Life of Meriton Latroon, printed several times from 1668 on. The printing used here is from 1671. The former was published as being written by "F.K." and the latter was published anonymously, although the title page stated "Printed for Francis Kirkman, and are to be sold at his Shop over against the Custome-House, in Thames-street". In The English Rogue, the most interesting parts from a copyright point of view are chapters XXII–XXIV, which are published here. Citation: [Kirkman, Francis] The English Rogue: Continued in the Life of Meriton Latroon, and other Extravagants. Comprehending the most eminent cheats of Most Trades and Professions. The Second part, London 1668 , p. 201-224.